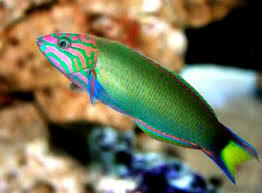 The Lyretail Wrasse is also referred to as the Lunare Wrasse or Moon Wrasse. 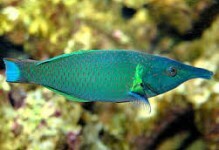 As an adult, it is green with bright facial and fin markings. 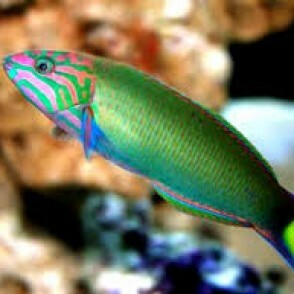 It should reside in a 125 gallon or larger aquarium with larger, aggressive tank mates, and plenty of rocks for hiding. It will become territorial and harass any new additions to the community, therefore, it should be the last fish added to the aquarium. 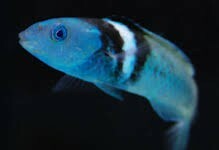 It may be kept with a mate if the aquarium is 150 gallons or larger. 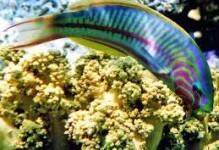 It may eat mantis shrimp and bristleworms. 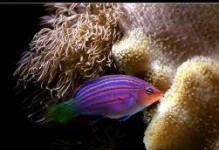 It does not eat corals or live plants.